You don't need many ingredients to throw this yummy tart together, serve it with a simple green salad, crumble over some salty feta and viola! Peel onions and slice into 6 or 8 wedges. Heat the butter & oil in an ovenproof frying pan over a medium heat. Add the onions arranging them roughly in a concentric pattern. Sprinkle with salt & pepper & cook for around 20 minutes, turning once or twice, until they are fairly tender and starting to caramelise around the edges. Trickle the balsamic vinegar over the onions and cook for a couple of minutes more so the vinegar reduces a little. Remove from the heat and make sure the onions are fairly evenly spread around the pan. Remove from heat. Roll out the pastry to a 3-4mm thickness and cut into a circle. 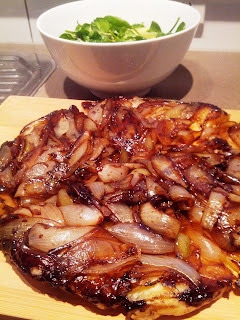 Lay the circle over the onions tucking the edges down & pop pan into the oven. Bake for 20 minutes or until the pastry is fully puffed up & golden. 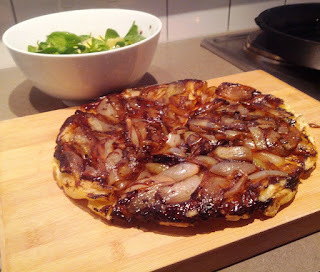 Invert the tart on to a plate so the sticky caramelised onions are facing up, on top of the crispy pastry. Serve straight away with a green leafy salad and crumble over some of your favourite salty cheese like feta. Enjoy!